The Lytro “focus later” camera has created a lot of interesting discussion on the web. With photography still in many ways the same as it was a century ago, this new way of capturing images has certainly struck a nerve. I’ve voiced my skepticism, but I wouldn’t want to pour cold water on this truly innovative device on its big debut. In case you’ve forgotten, the Lytro allows you to shoot a picture with minimal effort, then adjust the focus to your liking later, among other things. At an event in San Francisco today, CEO and originator of the Lytro’s light-field technology Ren Ng showed off the device, which only resembles traditional cameras in that it has a lens and LCD screen. It’s really more like a kaleidoscope than anything else. The front sports an F/2 lens with an 8x zoom — it was not specified whether that F/2 persists throughout the zoom range, but based on my understanding of the technology, I think it has to (update: yes, the f/2 is constant). Neither was the 35mm equivalent for focal length given. On the other end of the device, which is 4.4″ long and weighs only 8oz, there is a 1.46″ LCD touchscreen on which you can frame the shot and explore previously shot images. There are only two buttons on the device, one for shutter and one for power, plus a slider for zoom. You certainly have to give it to their designers: whether you like the shape or not, it’s unique-looking and practical in a way. The Lytro will come in two versions: $399 buys you an 8GB version (blue or grey) that holds 350 shots; $499 gets you a red 16GB version that holds twice that. This works out to about 22 megabytes per shot, which is comparable to many RAW shots being taken on DSLRs today. The actual “megapixel” value is hard to determine, and Ng described the camera as capturing “11 mega-rays” to an LFP file. I’m thinking that the final images are likely not that large in terms of square dimensions, but of course that square would contain far more data than a square JPEG. The specs say “HD quality,” which of course means very little. 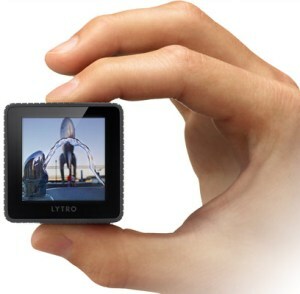 Notably, the pictures you take will be able to be hosted on Lytro’s site for free. Let’s hope they can scale that. They’re shipping in early 2012, but some questions remain. How long does the battery last? How does it hand low-light situations (we can’t take the F/2 lens at face value, though it’s certainly bright)? How will the photos be displayed — Flash, some kind of custom container? Will there be apps? And did they spend all of that $50 million? The camera is available for pre-order now at Lytro’s site.